For few users Bookmarks bar is very important component in a web browser. It allows quick hopping to favorite websites with minimum clicking. 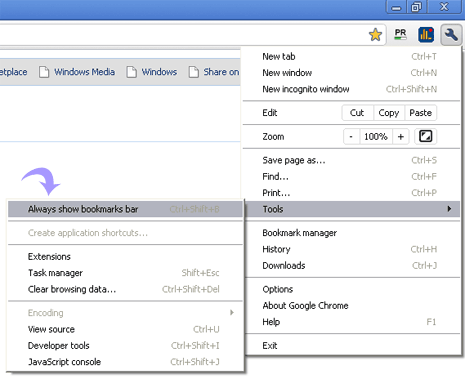 You can easily manage favorite websites in bookmarks bar in Google Chrome browser. By default, bookmarks bar is visible in new Chrome window. You can always hide or show bookmarks bar in active window from Chrome options. 2. Press Ctrl + Shift + B keys to show Chrome bookmarks bar. Press Ctrl + Shift + B keys again to hide the bookmarks bar. 2. Click on wrench icon and then goto Tools > Always Show Bookmark bar. The shortcut is pretty cool, thanx for the tip. I’d like it if the bookmarks could either always show or hide like in ie and firefox. I don’t like always having to scroll through the entire list to find what I need. It would also be nice if there were a search function. O ther than that I like chrome so far. Thanks for the tip. What a UI disgrace that I have to google the web to find the freaking bookmark bar on browser. Awesome, thanks for the tip on ctrl+shift+b. Wouldn’t have known it.